Hey cake loves. Although it's snowing outside at this very moment, Most of us are having a bit of Spring Fever. I'm not trying to rush the winter along by any means, I love the cold, However a bit of Spring and Summer could do us all some good. You guys know how huge my birthday cake was - I'll be making cake pops for a while thanks to those leftovers. 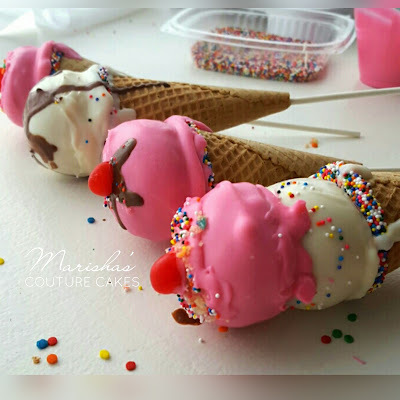 So what better to make then fun ice cream cone cake pops. This is a great technique for those such as myself who struggle with cake pops. The cake balls are supported by the cone and once set the lollipop sticks can be removed. This had to have been one of my favorite cake projects yet. Making this tutorial was so much fun, I felt like I was in candy land. Watch the fun video tutorial by clicking above. Click on the video title to subscribe to the YouTube channel and join me on my cake creating journey! Once the dough is together, form golf ball sized cake balls. 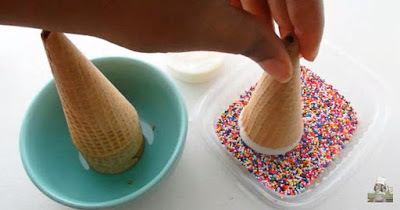 You can also use your ice cream cone for measurement. It should sit right into the cone without expanding too far out. For double scoops, make another set of cake balls but flatten one side slightly, light a half moon. 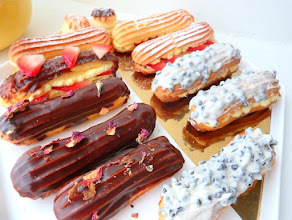 These won't need a stick. Once you've formed the balls, melt some of the candy melt. Dip the lollipop stick 1/2 in. into the candy melt and push half way into the cake ball. For top scoops, this step won't apply. 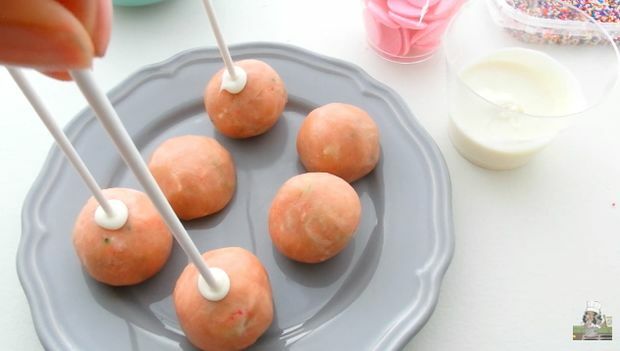 Put cake balls into the freezer for 20-30 minutes or the refrigerator for 1-2 hours. We're going to need a small hole at the bottom of the cone for the stick. With a knife, carefully cut off the tip. Make sure the stick will go through before doing the next step. 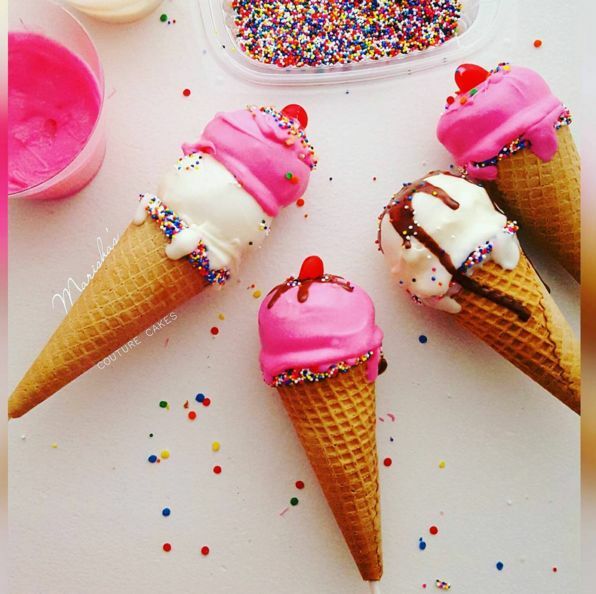 While those cake balls are setting up, jazz up the ice cream cones by dipping the rim into candy melts. 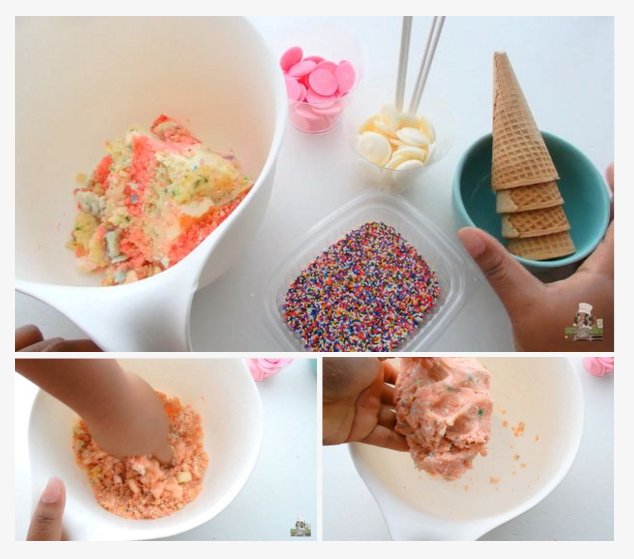 Let excess fall back into the candy melt then dip into confetti candy or sprinkles. Using a toothpick (or the back end of a paint brush like I did) add dollops of candy melt to the top of the cone to look like melting ice cream. Allow to harden for 5 minutes. Once the cake balls are ready, carefully dip each pop into the candy melt. 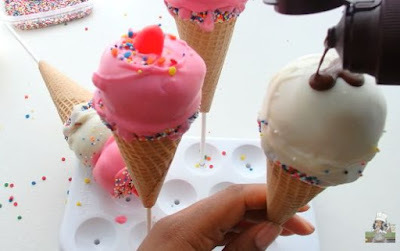 Place the cake pop into the cone. 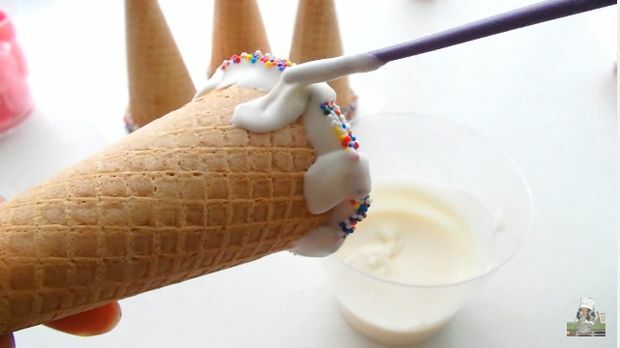 The stick should go through the bottom of the cone. 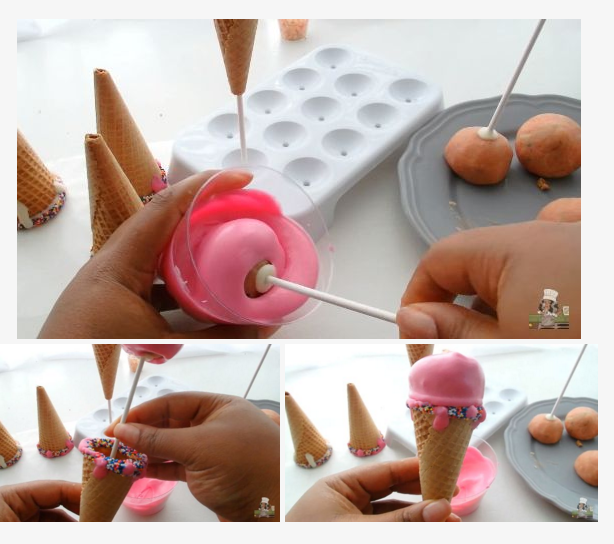 Gently pull the stick allow for the candy melt from the cake pop to melt onto the cone. If doing one scoop cones, here you can add sprinkles and jimmies. For top scoops, use a fork to dip into the opposite color candy melt as the first scoop. 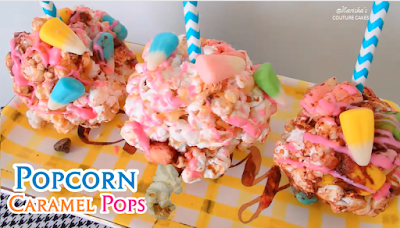 Cover as much as you can, and place on top of the ice cream cone cake pop. Hold the top scoop in place for a minute until the candy melt hardens. 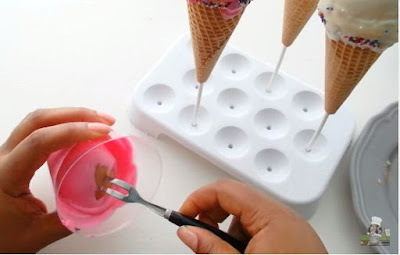 Add a little bit of candy melt to the top of the scoop to cover up fork holes. While wet, top the cake cones with sprinkles and all sorts of candies. I also cut a red jelly bean in half to use as a cherry. For the sundae look, add some melted chocolate and let drip down. At this point, you can remove the stick if you'd like. The scoops will stay perfectly onto those cones!